Since producing the first Prius in 1997, we have sold more than thirteen million hybrid electric vehicles around the world, saving more than 100 million tonnes of CO2. Hybrid technology is the basis of all our alternative powertrains. Using our basic hybrid architecture and the know-how we have gained, we can develop battery electric vehicles, plug-in hybrid electric vehicles and fuel cell electric vehicles that run on hydrogen fuel. In the 21st century we have to find ways to make vehicles that are kinder to the environment and reduce our dependence on oil-based fuels. We see hybrid as a core technology for achieving these goals, combining different energy sources in a single powertrain to obtain outstanding fuel efficiency with significantly lower emissions, at a price customers can afford. Since we introduced Prius, our first mass-produced hybrid car, in 1997, we have continually improved our hybrid know-how. Today our hybrids are not only more efficient than ever, with around a 10% improvement in fuel consumption with each generation, they also deliver stronger performance and are renowned for their hard-wearing quality, reliability and low running costs. To make the most of hybrid’s potential to reduce emissions, our aim is to develop affordable technology that can be enjoyed by as many customers as possible. This is why we have increased our hybrid range from a single model – Prius – to 39 today. As the range of different hybrid models increases, so the technology reaches more potential customers. This will help us meet our goals of having sold 15 million hybrids worldwide and reached an annual sales rate of 1.5 million vehicles by 2020. Over the years our hybrids have been on sale they have together saved more than 100 million tonnes of CO2, compared to the emissions that would be generated by equivalent petrol-powered cars. Our hybrids produce only very low levels of NOx, an exhaust emission that can damage air quality. We offer more hybrid models in more market segments than any other car maker, helping more people enjoy the rewards of our full hybrid technology right around the world. More and more people are choosing hybrid, giving it an increasing share of our total sales. In 2018, almost one in every two Toyotas we sell in Europe is hybrid-powered, and that share is continuing to rise. "While the world has been debating all-electric cars, Toyota has put more than 13 million hybrids on the road." Our hybrid system uses a gasoline engine and an electric motor. It is a “full” hybrid, which means that the vehicle can be driven using its electric power alone, as well with the engine and electric motor working together. This makes it different from other “mild” hybrid systems, in which the electric motor only works to boost the performance of the petrol engine. Electricity is generated as you drive the car, captured from the energy created when you brake or slow down. This power is then stored ready for use in the hybrid battery. A power control unit automatically determines the most efficient power source to use at any moment, whether you are in slow moving traffic or on the open road. In stop-start traffic, our full hybrid system switches to all-electric EV mode to maximise the benefit of driving with zero tailpipe emissions and zero fuel consumption. If battery power runs low, or you increase your speed, the hybrid engine automatically restarts. Our full hybrid technology uses two power sources to power a vehicle – a petrol engine and an electric motor, supported by a powerful battery. It’s an intelligent system, so it is always working out the most efficient source of power to use. It even stores up extra energy every time you brake or slow down. Discover the benefits of owning a Hybrid. Discover the simple truths behind Hybrid. Find the answer to your Hybrid questions. Europe is a key market in our hybrid programme. Already four in every ten cars we sell here is a hybrid. The strong market growth is supported by our European production. The hybrid Yaris, Corolla, Corolla Touring Sports and C-HR are built at our factories in France, the UK and Turkey. The increasing popularity of our hybrid models reflects how customers now accept hybrid as a mainstream choice and appreciate the multiple advantages it offers as an alternative to conventional gasoline and diesel models. Two thirds of all Corolla models and half of Yaris sold in Europe are hybrids. Four out of every five C-HR models we sell are hybrids. Together these European-built cars represent three in every four hybrids we sell in the region. We have always recognised the value of making vehicles within or close to the markets where they will be sold. This is true, too, of our hybrid models, with production plants operating in a number of countries outside Japan. In Europe we have hybrid production facilities at Valenciennes in France (TMMF), Burnaston and Deeside in the UK (TMUK) and Sakarya in Turkey (TMMT). TMMF and TMUK are two of our designated sustainable plants, which set global standards for environmentally efficient manufacturing. This includes reducing demand on natural resources, recycling and eliminating waste, drawing energy from sustainable and renewable sources and working in harmony with the local environment and communities. By making hybrids locally, we further reduce their environmental impact by removing the need for long-distance shipping around the world. This helps us shrink our vehicles’ carbon footprint and supports our commitment to reducing emissions at every stage of a vehicle’s lifecycle. Our Valenciennes factory in northern France has been building the Yaris Hybrid since 2012, alongside the petrol and diesel versions. Burnaston in the UK was our first factory in Europe to build hybrid vehicles. It is the home of the hybrid Corolla and Corolla Touring Sports. In 2016 we started building the hybrid C-HR, Toyota's entry to the fast growing crossover segment, in our hybrid production facility in Sakarya, Turkey. The Yaris Hybrid stands out for its silent running, comfort & easy handling, particularly in urban areas where it can run solely in electric mode or with limited use of the petrol engine. Thanks to CO2 emissions as low as 76 g/km (WLTP: 101 g/km) and the hybrid system’s exceptionally low running costs, the Corolla Hybrid represents a great value for money. The Corolla Hybrid Touring Sports combines a relaxing and stress-free driving experience with a superior luggage capacity of up to 1,606 litres and high levels of practicality. The new Prius features a new hybrid system and ground-breaking aerodynamic design to achieve fuel consumption as low as 3.0 l/100 km and CO2 emissions starting from 70 g/km. Prius+ combines the iconic Prius triangle silhouette with a spacious interior for seven passengers and ample luggage capacity. Prius Plug-in Hybrid is the perfect fit for those who want a hybrid car with the benefits of extended electric vehicle (EV) driving. It is the most dynamic Prius yet, delivering an unforgettable driving experience with smooth handling and powerful performance, while you can be confident in the knowledge that you are also being incredibly efficient. Its full hybrid system combining a 2.5L petrol engine with a powerful electric motor, the RAV4 Hybrid is available in both front- and all-wheel drive variants. Toyota C-HR’s combined cycle economy starts from just 3.6 l/100 km. It reflects significant advances in battery, electric motor and petrol engine technologies. Customers appreciate it - almost 80% of orders for our new Toyota C-HR are hybrid! Concentrated luxury - enjoy smooth performance, hallmarked by extremely low CO2 emissions from just 82 g/km. A stronger body for greater control - the IS 300h delivers 223 din hp of full hybrid power, yet emits just 97 g/km of CO2. Designed to command attention, its striking angles and bold looks bring 'amazing in motion' to the streets. The GS 300h Full hybrid delivers 223 din hp, yet emits just 109 g/km of CO2. Distinctive, powerful, luxurious: the full hybrid GS 450h is an amazing drive. Sharpened sophistication - drive the SUV benchmark for full hybrid performance, delivering 313 din hp of sophisticated power. First luxury coupe powered by full hybrid powertrain. The most powerful, full hybrid sedan in the world, the LS 600h is as luxurious as it is innovative. 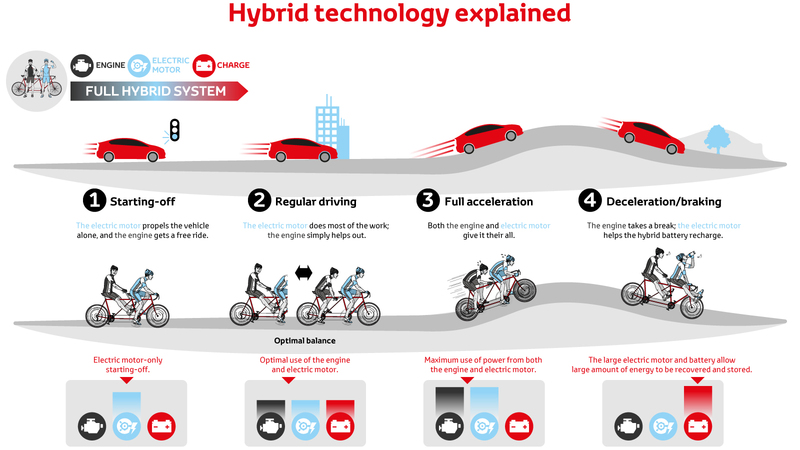 What is Hybrid? Discover how our Hybrids have been designed to make your life easier. Simple Truths Discover the simple truths behind eight common Hybrid misconceptions. FAQs Here you can find some popular frequently asked questions and answers to help you with your decision to switch to hybrid. Toyota Hybrid Discover more about Toyota Hybrid and see why over eight million people have chosen a better way to drive.